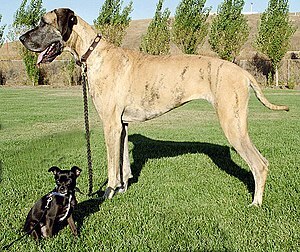 This mixed-breed Chihuahua and Great Dane show the range of dog sizes produced by artificial selection. Artificial selection is the intentional breeding of plants or animals. It means the same thing as selective breeding. Selective breeding is a technique used when breeding domesticated animals, such as dogs, pigeons or cattle. Some of these animals will have traits that a breeder will want to preserve. The breeder will therefore select those animals to breed that have such a quality, rather than those that do not. Selective breeding often leads to inbreeding, and loss of fertility. To control this, most breeds are outcrossed or backcrossed to wild-type individuals, or at least less inbred stock. This is done every so many generations: the details differ from breed to breed. Charles Darwin used the example of artificial selection to introduce his idea of natural selection. Artificial selection may be contrasted with the process of natural selection. In natural selection, the differential reproduction of organisms with certain traits happens. This is because some variations help the organism to have better survival and reproduction. The process maintains or enhances the fitness of a population in its natural habitat. 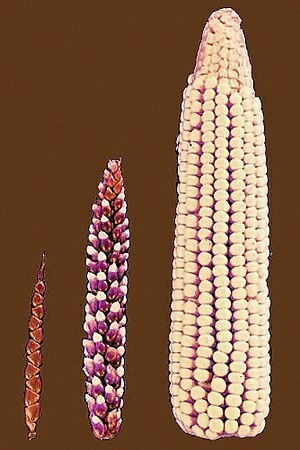 Artificial selection may sometimes be unintentional; it is thought that domestication of crops by early humans was largely unintentional. Inbreeding is a particular kind of selective breeding, designed to produce a population which is genetically virtually identical. Such populations are rarely viable outside the laboratory. This page was last changed on 3 December 2014, at 04:19.